BOSTON - Trailing 2-0 heading into the final period, the No. 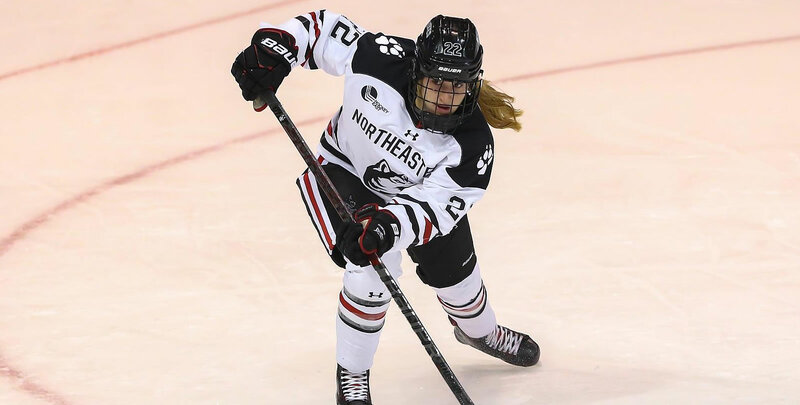 3 Northeastern women's hockey team staged a dramatic comeback to force overtime before falling in a heartbreaker to No. 6 Cornell, 3-2, in the NCAA Quarterfinals before a crowd of 1,401 at Matthews Arena on Saturday afternoon. The Big Red (24-5-6) jumped out to a 2-0 lead in the first period and held the advantage until midway through the third when the Huskies (27-6-5) turned the tides to force an extra session. Sophomore Veronika Pettey notched her 18th goal of the season at 9:32 of the third period with a diving effort to poke home a rebound following an Andrea Renner shot at the right of the Cornell cage. Sophomore Skylar Fontaine then tied the game at 2-2 with 5:29 remaining in regulation, wristing a shot home from between the circles to send the home crowd into a frenzy. Just over five minutes into overtime, Gillis Frechette took a stretch pass from Diana Buckley and skated in alone on goal, before making a nifty move to slide a shot past Aerin Frankel (25 saves) to send the Big Red to the Frozen Four. The defeat marked Northeastern's first overtime loss of the season; the Huskies were 4-0-5 in OT games before Saturday's setback. Cornell netminder Marlene Boissonnault made 22 saves to earn the win, while Grace Graham led the visitors with a goal and an assist offensively. The Huskies finish the 2018-19 season with 27 wins (tied for the second-most in a season in program history), as well as a Hockey East regular season title, and a second straight WHEA tournament crown.